in honor of tonight's post, my friend carly & i went back to slurping turtle. yummmm !!! 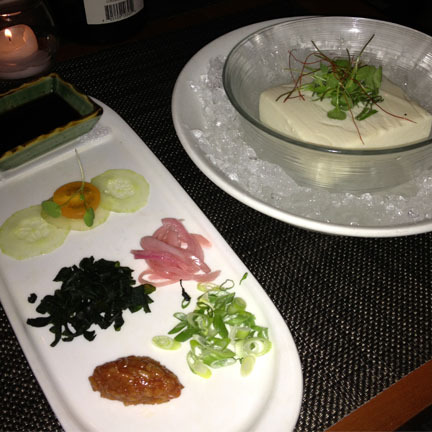 since my post on slurping turtle, we're all aware that i am pretty much obsessed with chef takashi yagihashi ... and a visit to his wicker park restaurant was on my "must try" list. josh & i finally made it over to takashi ... which "features contemporary french-american fare with japanese influences, a mixture of chef takashi's previous ventures." but wait, there's more ... "the atmosphere is unique in that it allows for a more personal dining experience, combining the cuisine and service of a fine dining establishment with the warmth and accessibility of a neighborhood tavern ... the contemporary cuisine features ingredients of the highest quality from throughout the world including maine, japan and australia. 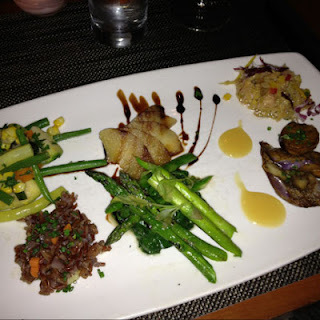 chef also uses sustainable fished seafood and local seasonal products whenever possible. no preservatives are used, including msg." loves it! anywho ... there was only one item on the menu that could easily prepared vegan. but chef takashi & the team hooked me up with a couple other items. yay! red onion, green onion, wakame, umami-ginger soy. no bonito flakes. i love me some interactive food ... and this certainly was that. but also ... so good! each bite could use one or more of the side items and make a tasty flavor combination. i said to josh that the last time i felt so interested by my food was at alinea ... delicious & fun. can't ask for much more. 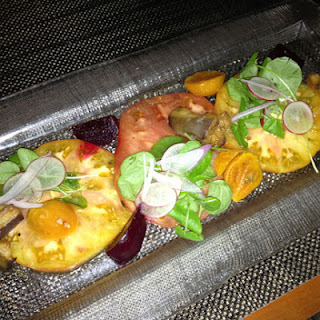 tomatoes, red & yellow beets, eggplant & vanilla bean vinaigrette. my love for tomatoes & beets is unwavering. so this salad was pretty much perfection ... fresh & flavorful perfection. clockwise the top left ... mixed sauteed veggies, quince w/ a balsamic reduction, cabbage, eggplant, asparagus & spinach, wild rice. first things first ... i literally said out loud to josh : "this is the best cabbage i've ever had." then, i again literally said : "this is the best spinach i've ever had." now ... i've not eaten that much cabbage. but spinach? spinach i know. uh-mazing. i'd never had quince before, so it's safe to say that's the best quince i've ever had ... that's not to say the rest of the items on this dish weren't also fantastic ... each little section of food was just so crisp & delicious. a lovely, light entree. a delightful little palate cleanser & dessert. i was so full from my insane veggie dishes that i really had no room for anything besides this. 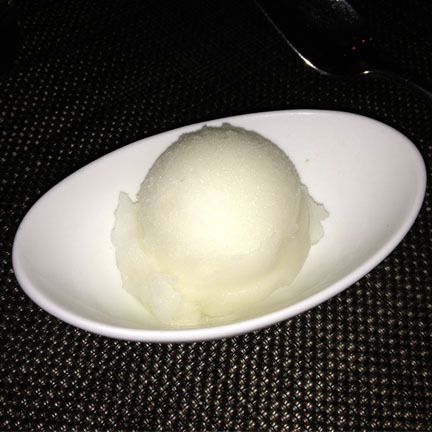 they had a ton of other sorbet options, but our server said this was the best. and it was goooood. highly recommend. this was the boldest of the green tea options ... go big or go home, right? 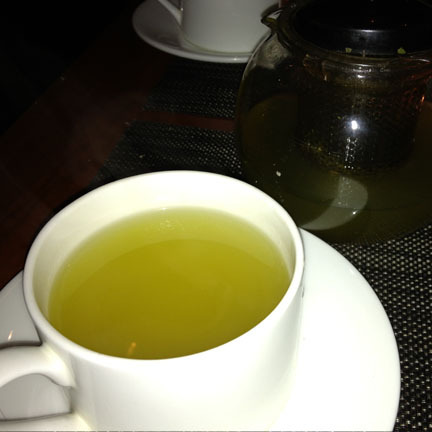 i normally don't get a post-dinner beverage, but josh opted for an espresso, so i decided to give in to my recent green tea obsession and go for it. delish. besides the food being absolutely fabulous ... chef takashi was at the restaurant !!! josh & i sat upstairs, so i sadly did not to see him in action ... however! when we were waiting outside for the valet, i saw him look my direction from the kitchen, so i gave a quick little wave! and he waved back! yeah, we're basically besties. where i waved ... halley = happy, josh = mortified. c'est la vie. so vegans, if you're looking for some really fantastic french/american/japanese cuisine, takashi is an absolute must try. it's definitely a new favorite for me & i know we will be back. thank you so much ... i'm glad you like my little blog! i love that all forms of non-meat eaters enjoy ... spreading veg love!